Hi there! We are home now and inflicted with the usual bug bites and camping exhaustion :) I went to bed at 10 last night, which I rarely do, but really needed some solid sleep. This week I’m starting with 2 basic blocks to get us started, and I’m going to share some of the most basic steps to encourage those of you without experience thus far. To begin, have your iron & ironing board, starch if you like (I really, really like!) cutting board, ruler and cutting mat out and ready to use. I like starch because it gives the fabric a crisp finish and helps with stubborn bolt creases. Just be sure to treat all your fabric the same, if you starch some, starch all. It also tightens the grain, causing it to shrink just a tad. A classic 4-patch. 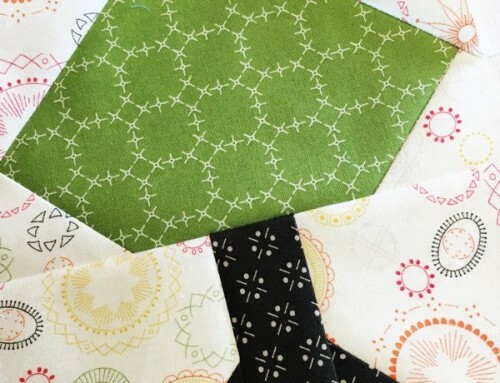 You can make this block in any size and it’s still a 4-patch, a great addition to lots of quilts, and a great place to start! Since we are using 1/2 yard cuts, I decided to take the selvage off and use one end, usually we use the width and cut strips, but I don’t need a lot of these and want to conserve my fabric. Cut one strip 6 1/2″, then square the end, and crosscut 2 – 6 1/2″ squares. Repeat with your alternate fabric, and lay out blocks as shown. I chain stitch as much as possible – it save thread and time. Next iron your seams, first set the seam by pressing it just as you have sewn it. Then open your seam, and carefully press open. Flip it over and press from the right side as well, make sure you didn’t get any extra creases in there. Usually I do this in my hands, without a camera….Open where your seams match up to verify that they are lining up as you wish. Pin on either side of the seam, in the seam allowance. Match the edges and pin in the center as well. When sewing, wait until you have your needle in the seam allowance to remove your first pin, then slowly go over the seam and remove the second pin. I always double check my seams before I iron, stitches are easier to remove when they have yet to be ironed. Learn from my experience! They matched so I ironed, if yours do not match as you would like, take out an inch on either side, and try again. Press your fabric, fold with selvage edges together, and square your edge, notice that my ruler is lined up on the folded edge of fabric. Cut one 3 1/2″ strip. Remove the selvage edge and crosscut 8 – 3 1/2″ squares. Layout your squares in the block formation, and pin pairs together. I like to turn one over onto the other, then pin, so I don’t mix things up. More chain stitching, saving thread and time. Press your seams open as instructed earlier. Forming rows, lay the left over the right and pin. Sew and press seams, layout rows. Turn one row down onto the next and match seams up. Check points and press seams open. Join the two halves together, pin carefully and sew. There’s lots of little steps in there, they go quick once you get into a rhythm. 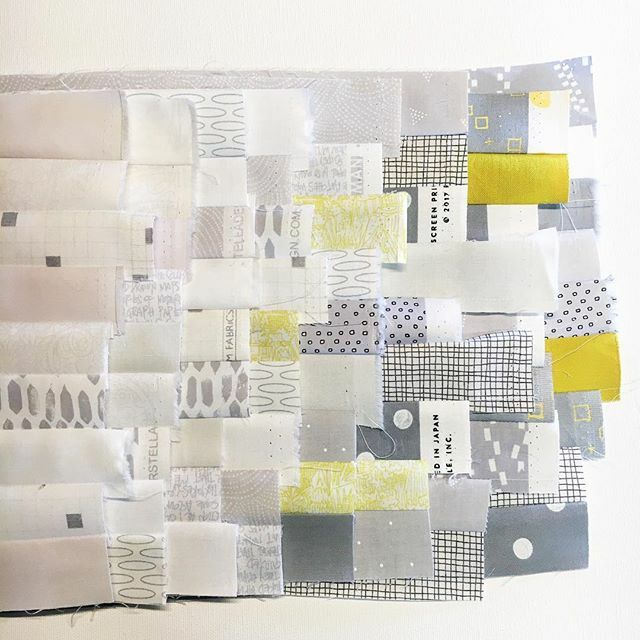 You can piece one block at a time or do all the cutting and pinning at once – do what makes you comfortable :) Do you have questions? I’ll do my best to answer then in the comments. I hope that things are clear and easy to understand. I just realized this would be a great way to cheer each other on :) And encourage you to get them done right away. 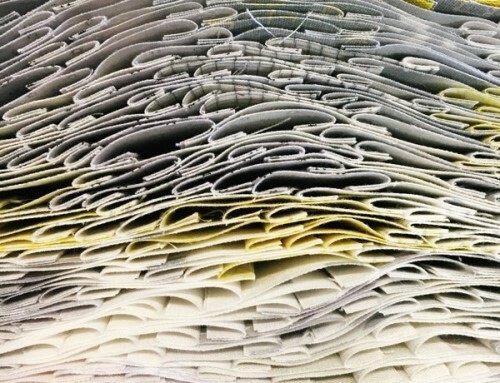 I’ll still post a list this week of blogger’s quilting along, as not everyone blogs. PS – Here’s a image of the entire quilt! The instructions look great! I love seeing all the details, and you have spelled it out nicely in words and pictures. I can't wait to get started. I just found some fabric at home to use. I had intended to use it in another layout, but I think I will love it in this quilt. Such detailed instructions – i LOVE it!!! If I didn't know how to do this before, I would DEFINITELY know now….. The instructions look very detailed and I love your fabric! Can't wait to get started on these blocks this evening! I just stumbled over your blog. Wonderful how you describe your way to Utah and how you became a passionate Quilter. I discovered how much fun it is to sew about a year ago myself. Knew some basics, but now I found my passion in sewing bags of all sorts. I use Martelli's Ergo cutter – I tried one out at a local show and loved how smooth it cut! 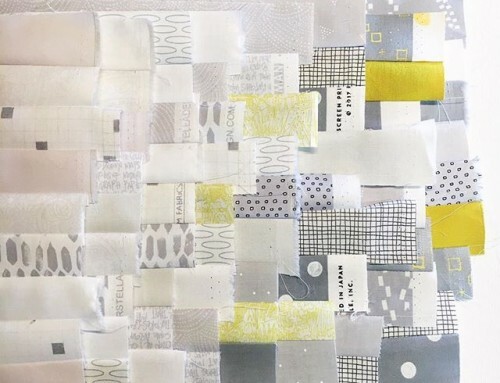 As someone who has been wanting to start a quilt for the longest time, but has been so intimidated, this looks doable. Thank you Amy so much for making it easy for people like me! Amy, did mom order one of the cutters? I know she was asking you about the web site. Cuz i was thinking I could check her out if that were the case, see if I like the angle of it. I am buying material at the shop hop tomorrow! Then I'll start.! The steps look great. The instructions were so easy to follow! Thanks for this quilt along! I linked myself as a joiner. That is a great tip for getting that crease out! 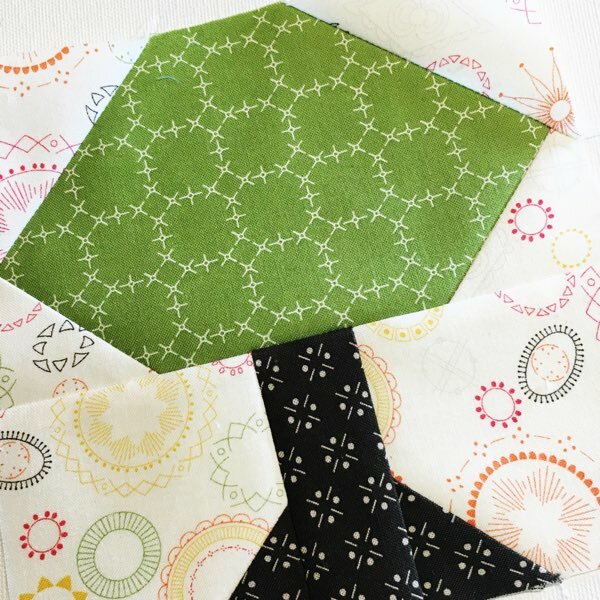 These blocks are really fun, especially with Sis Boom fabrics. I really adore that mosaic block! I am joining in! Cutting into my beloved Wild Thyme and Seedpods! I did my cutting before dinner and hope to sew tonite while listening to the White Sox game. I would like to suggest that maybe you could set up a flicker group so that those of us without blogs can post pics. I would love to see everyone's blocks! Great tutorial by the way, so thorough. Cheers! Andie. Quick question…. I have a cutting board and rotary, but have no idea what size ruler to buy (as a first time quilter). What would you recommend? 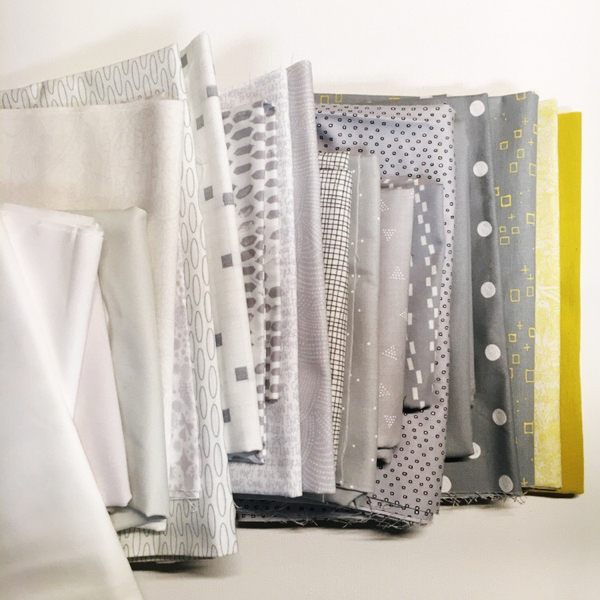 Do you use a variety of sizes? What would be the most practical to start with. 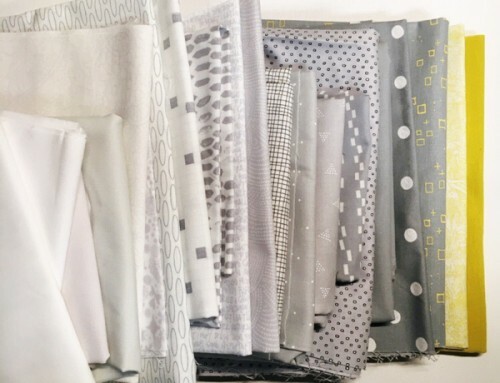 I have asked the ladies at our local fabric shop, but they are clueless…. I am ready to go. I was sort of depressed I could not participate in the quilt class I took last year. But you gave me the perfect solution. If you look at my blog for give me, It's new and I am working on the post's. I do want to participate, but not sure I will be able to keep up. I will be plugging along though! The linky is a great idea! Your blocks are darling! oops–I finished the two squares and my 16-patch block is a little smaller than the 4-patch. I assume my 1/4" seams are not accurate–Am I supposed to do a scant 1/4" seam or do you think my squares are not exact? I'm new to quilting and I thought cuts were true to size and the seams measure 1/4" exactly. Where do you think I messed up? Just finished the first 2 blocks! The directions are very detailed and easy to follow. Can't wait for the next blocks! Thanks Amy! I am so looking forward to next weeks blocks! 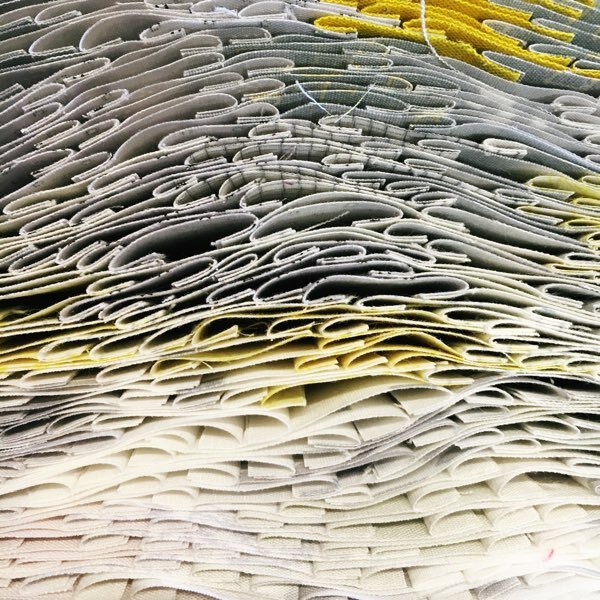 Question…..What type of rotary cutter do you use? I did block one tonight. I have a question for you. Why does my last name appear on the link to my blog? I guess it is no big deal but I was just wondering. Thanks for this quilt along. Thanks Amy :) It is SO good to ask questions from someone who knows what they are talking about!!! Amy, Thanks for the great instructions!! I was so excited to get home today to quilt! I love some of the other blocks that I have seen so far! 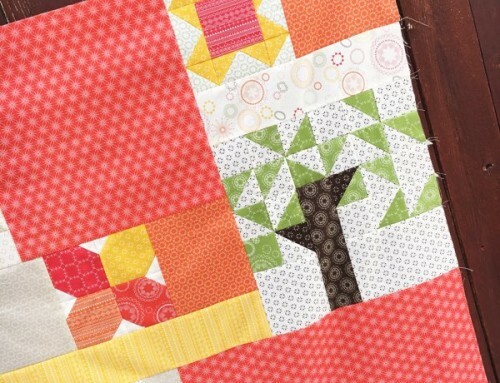 But all the quilts posted so far are awesome, and I am loving all the color choices and themes! I reviewed your tutorial on accurate 1/4" seams, and made a new 16 patch–much better. Thanks, Amy, I'm learning a lot–I think the first thing I'm learning is that I need a new sewing machine! Finished these this morning and posted pics on my blog! I am doing these in calicos but am thinking of doing another in batiks! Thanks Amy – I love the first two! I finished my squares yesterday. That was fun and I can't wait till next week. Thank you Amy for hosting the Quilt-along! missknitta – I can't comment on your post because I don't have a wordpress account, but I like the Home Sweet Home feel the fabrics have. Hooray! My first two blocks are done! I have finished my first block, hope to start on the next one this weekend. Hey Amy! I got my first two blocks done…easy peasy. If I'd not known how to do these, I surely would have after reading your excellent instructions. Looking forward to next week! Just linked up! Thanks for doing this and teaching some great techniques!! I just linked up. Your directions were great …esp your tips on pinning. I think it really made a difference on the 16 patch for me. 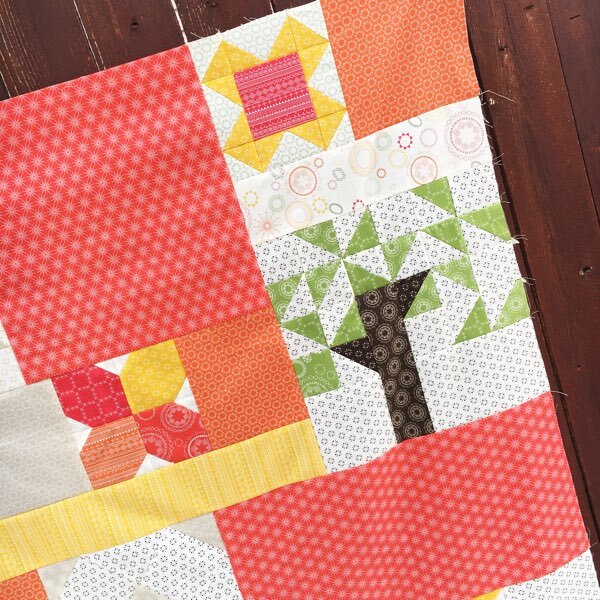 I am enjoying your quilt along so far…thanks for sharing your talents with us, Amy! Thanks for the tutorial Amy, I just added my blocks on the link above. I think this is the first time I had a block finish with all of the corners lining up, YAY! What a great Quilt along! I am still without a sewing machine, since I gave our older daughter my old one…still trying to decide which to buy! I have been working on a little hand piecing on one of my many unfinished ones! I will be joining late …. Will start tonight after I get home ! How exciting !!! I'll try to get you pics ; don't have a blog ! I am having so much fun and loving the quilt so much. Thank you for this. Posted my link and off to look at everyone's progress…. I've posted mine. Quiting is much harder then it looks! Hi Amy just got mine posted ,this is giving me a chance to try various types of block, what fun. Oops, there has to be one in every crowd…am working on the blocks now…just saw your post on "Stash Manicure", decided to join, and jumped the gun..will post pictures soon.. Finished blocks 1 and 2 and posted on my blog! YAY! i have been so busy trying to get caught up that i haven’t had much time to post my pics!! week one is up!